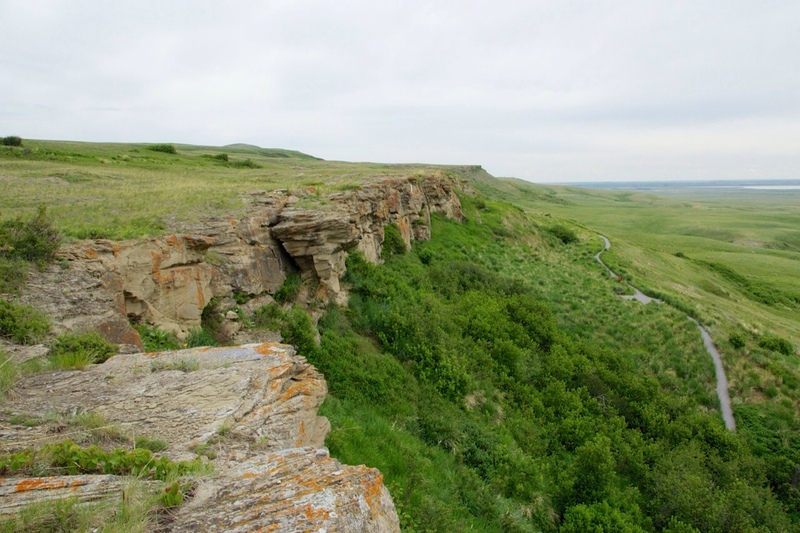 The buffalo jump was an ingenious, communal way for members of the Blackfoot Nation to build up stores of food, hides, tools and weapons needed to get through the harsh winters of the western plains. 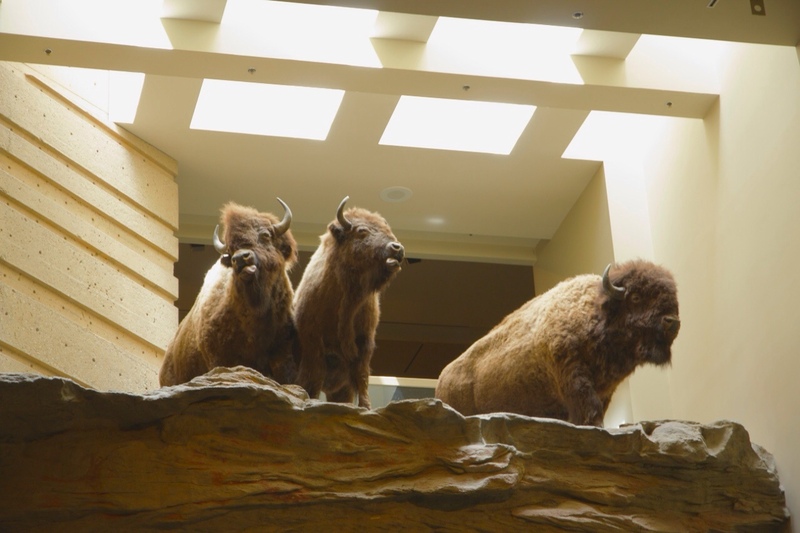 The bison would be herded toward the jump, a cliff at the end of a slight rise of land, a stampede would be started, the buffalo would close ranks and follow their leaders to their eventual demise on the plains below. 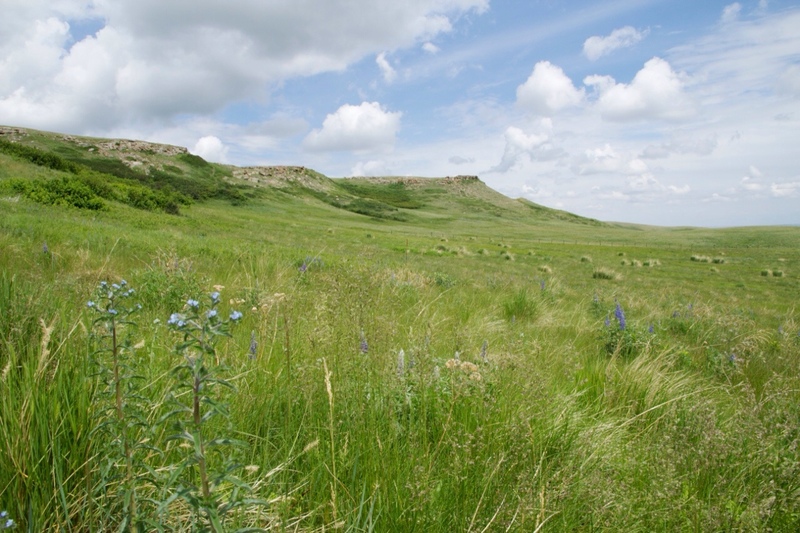 Head-Smashed-In is one of the oldest, largest, and best preserved buffalo jump sites on the western plains. 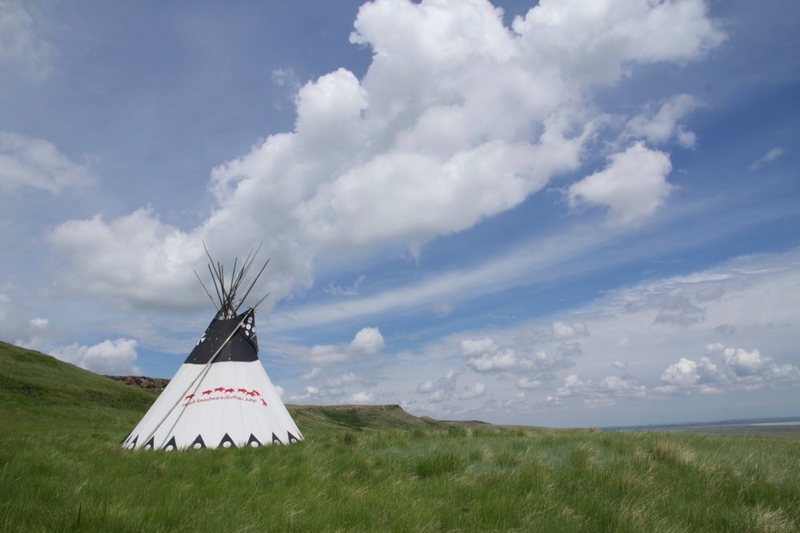 It is located in Alberta, Canada, near Pincher Creek, where we are camping and fishing for a few days. This World Heritage site tells the 6,000 year old story of the important role of the buffalo to the indigenous plains people and how the activities that took place here at this butchering and kill site were an integral part of their lifestyle, traditions and spirituality. These were no small operations. Spiritual ceremonies were held to call the buffalo to the site. Hundreds helped to prepare for and execute the stampede. Below, in the butchering area, even more prepared drying racks for drying thin strips of meat, or dug boiling and roasting pits where the meat, fat and bones were cooked or gathered rocks to be heated for use in boiling the water. The carcasses were skinned and butchered and no parts were wasted. This cliff saw tens of thousands of buffalo plunge to their death over thousands of years.The interpretive center at the site was beautifully designed and had extensive, multi-media presentations of how and why Head-Smashed-In was so important to the people who used it as well as the archeological history. Wandering along the cliff, following the path at its base, looking out across the plains, watching two red tail hawks soar above, I tried to imagine the area filled with tipis, drying racks and cooking pits. I imagined the joyful sounds of a community working toward a common and important purpose. I tried to not think of the sounds of dying animals or the sights and smells of blood and slaughter. However, if you walk on the paths of those who lived here, you kind of need to accept the whole package. It is not quite the same as heading to the Piggy Wiggly for some chop meat or chicken cutlets. I had read about this before but never saw any photos. Thanks for that. Walk in another mans moccasins ..as you say. Things are not so different for food sources today I would say..except I don’t think the joyful sounds of community laughing and calling out as they work are heard. Fascinating story. Where is this? Thanks, realized I never said it was in Alberta, Canada…near ft. Macleod and Pincher Creek. we have no internet unless we find a Tim Hortons and I rushed to get the post done before my coffee ran out.